Students at C.R. Weeks Elementary School in Windsor Central School District made signs as part of a bullying prevention program event. One in 3 students experienced bullying in 2017-18, the third consecutive year when this aggressive behavior increased, according to a recent YouthTruth Student Survey. Additionally, nearly 40 percent of middle school students last year said they were bullied, as opposed to 27 percent of high schoolers. These statistics spurred Poudre School District in Colorado to apply for a grant to combat bullying in grades 6 through 8. Below, you can find what Poudre and other schools are doing about bullying. Solution: The CDE accepted the grant proposals later that spring, so the grant-implementation coaches at each school created a grant-mandated prevention committee comprising either themselves or counselors, parents, community members and school staff. Out of the available CDE-approved programs, three committees chose the local Expect Respect initiative where an implementation coach comes onsite to present bullying prevention strategies to students. The fourth school adopted Second Step where classroom teachers deliver the lessons to students. The four implementation coaches assigned to each school now meet once a month to share best practices and ways to improve their program. Emma Kapon and Sascha Gomberg, fifth grade members of the Elementary Student Government at Bridgehampton UFSD, speaking at a Board of Education meeting with Jessica Rodgers about various bully prevention projects, such as the bully court and bully button. Challenge: District leaders wanted Bridgehampton UFSD to adopt Positive Behavior Interventions and Supports status to try to prevent problematic behaviors before they occurred. Solution: Administrators received three years of training from a behavior specialist through the local Boards of Cooperative Educational Services. The district funded this training and other initiatives with a Paddlers for Humanity grant that supports mental health programs. “Since there are always changes in administration and staff employment over the years, we have recently entered a rebuilding phase of these programs to ensure that we provide the best support for our students,” says Jessica Rodgers, literacy specialist and instructional support team/Dignity Act coordinator. 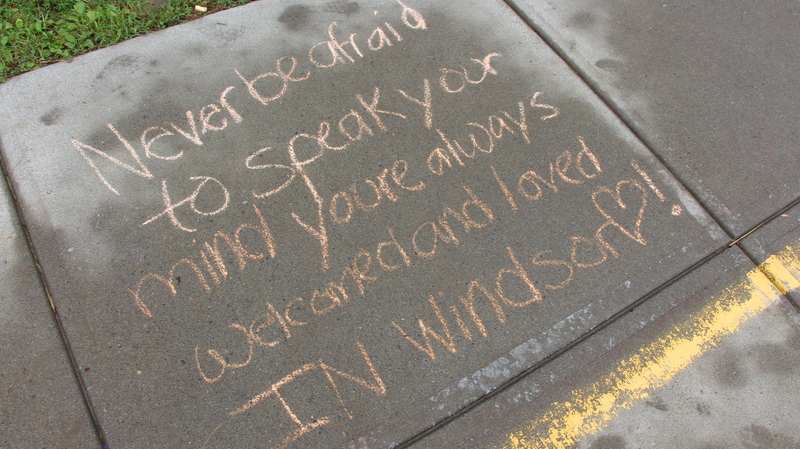 Students wrote positive messages outside of Windsor Central Middle School as part of an event against bullying. Challenge: District leaders researched numerous bullying prevention programs before implementing the Olweus Bullying Prevention Program in every school. This program acts as the umbrella to other districtwide initiatives, says Superintendent Jason A. Andrews. Solution: Two district administrators went through weeklong Olweus certification training, funded by a local grant. These administrators then led a four-day training session for the district’s five coordinating committees, which include education officials and stakeholders representing each school. Committee members then trained school staff before hosting an annual fall kickoff event to remind students and staff about the program. Challenge: District officials wanted to reinforce positive behaviors on buses and to streamline the referral process when parents reported incidents. “Since there is less supervision on buses, we wanted to give our drivers an extra set of eyes and ears so they can watch the road,” says Superintendent Todd Davies. Solution: At the start of fall 2018, Davies, along with teachers and administrators, volunteered to ride buses for three weeks to prevent the usual beginning-of-the-year routing glitches. The district received positive feedback from the community and bus drivers, so Davies worked with transportation department officials to continue the program, especially on elementary school buses that require more supervision. The new initiative began in December where one teacher was assigned to each of the 25 elementary bus routes. 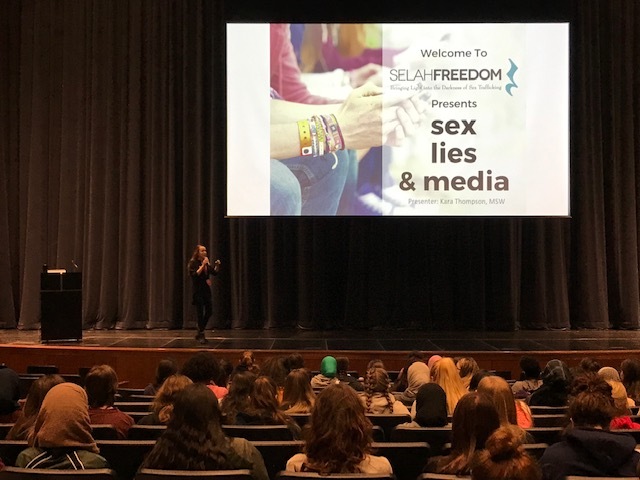 In addition to the anonymous reporting tool, Oak Lawn Community High School hosts bullying prevention programs where speakers come to talk about ways to promote positive behavior. Solution: School leaders posted a link on the school website that leads to the anonymous reporting tool. “Every year, we tell students that this is completely anonymous, and that we do not track or share,” says Hernandez. Administrators remind students and parents how they can use the form and what information they need. Altogether, the school has received 119 reports in four years. Students submitted 22 in 2015-16 and 42 in 2017-18. All submissions go to three dean’s office administrators, who must act by the next day. “We created an online form for accountability,” says Hernandez. This form includes the names of deans and their plans for addressing each incident. “We want to build that trust so students can feel as though they can involve us if they need us,” says Hernandez. 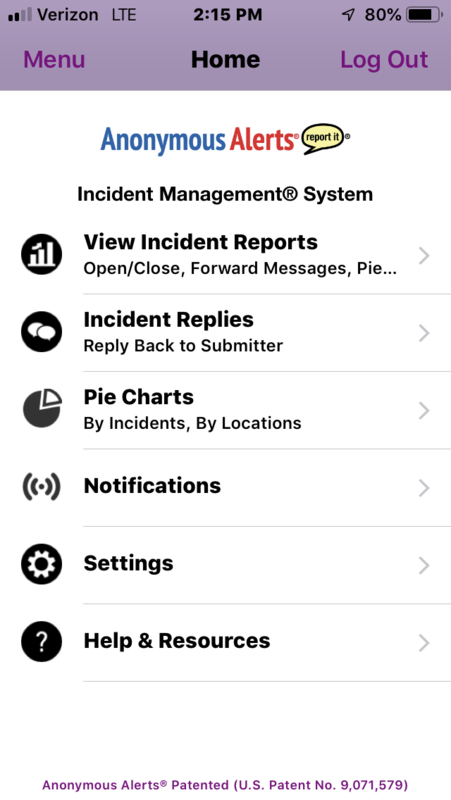 Sand Springs Public Schools uses the STOPIt app that provides anonymous reporting and incident management solutions. Challenge: In September 2018, the Oklahoma Insurance Group reached out to multiple school districts, including Sand Springs, to provide a free rollout of STOPIt, an anonymous bullying reporting app. Solution: Since December 2018, students and parents have been using STOPIt to anonymously report incidents and communicate with administrators. Administrators showed a leadership team how to set up the app districtwide, while principals learned how to address the calls they received. STOPIt also supplied a rollout package that included promotional posters and a tutorial video that teachers shared with students. 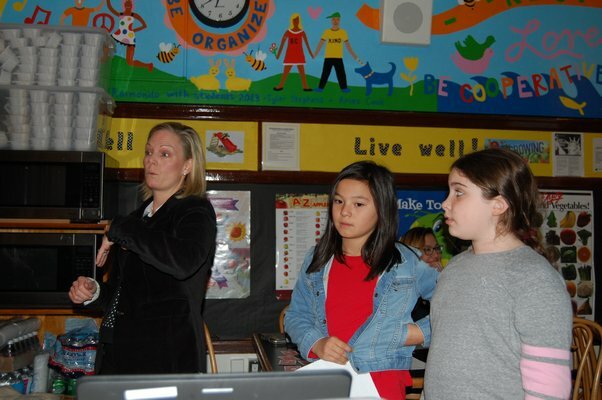 The district also shared details with parents. Newtown Public School District has adopted the Anonymous Alerts app for middle and high schools. Challenge: In 2015, a Safe and Sound Schools member whose child died during the deadly Sandy Hook shooting reached out to the district to suggest an anonymous reporting app to combat bullying and violence. At that time, Newtown provided two sources for anonymous reporting. But those tools didn’t generate any results. “We had a 24/7 anonymous line to local police that didn’t receive any calls because kids today are so involved with apps,” says Lorrie Rodrigue, superintendent of schools. Solution: District administrators received one free year of service for the Anonymous Alerts app for middle and high schools before adopting it. “We didn’t roll it out to our elementary schools because we want those students to seek help in person or to tell a parent if there is an issue,” says Rodrigue. Rodrigue showed upper-level students and parents how to use the app, which allows students to anonymously report incidents via text.